I had decided that I was going to do no Christmas knitting this year. I get tired of associating so many deadlines (and, therefore, stress) with a hobby that I meant to be strictly for my own enjoyment and relaxation. But in the end, I couldn’t quite keep my promise to myself. I only broke it in the tiniest way possible, though. Two pairs of child’s socks. Not much work, and no stress at all. 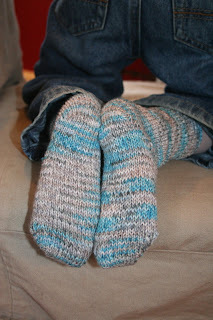 In a way, it’s a little sad that I don’t knit more things for my boys. Part of the problem is that I can never knit just one of anything for them. Whatever I make for one of my sons, I had better be prepared to make for the other. Also, it turns out that little boys grow kind of fast. So I have to accept the fact that anything I knit will be outgrown rather quickly – and sometimes I’m just not willing to put the time into something that will only get a few months of wear. And finally, if you don’t have three year-olds in your life you might not realize what fickle creatures they can be. My boys can be very excited about something I’m in the process of knitting, and then thoroughly uninterested in it when I present it to them. Knitting for them is definitely a gamble. It’s not always a gamble I’m willing to take, when there is another person I know (namely, me) who is always pleased to receive a handknit item. 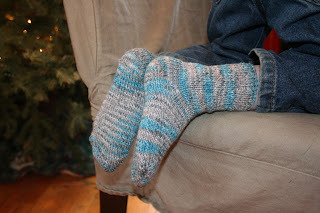 This summer, when I took Little Buddha to Knit Nouveau in Birmingham, I let him pick out a skein of TOFUtsies, promising him a pair of socks for him and his brother. He picked hot pink. I talked him into a blue/grey instead. *sigh* Clearly, I am more bound by the societal norms of gender construction than I once thought: I am simply not ready to spend hours knitting hot pink socks for my sons. 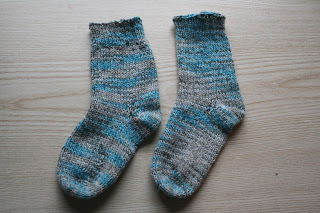 Making these socks brought up all kinds of tender feelings in me. Those feet! Those feet were so tiny once. The length of my thumb. I would slide my hand along the soft, fat bottoms of their feet while they nursed. I would gaze at those impossibly tiny, impossibly hot pink toes, and marvel at their beauty and perfection. Those feet! Those feet are so big now. Almost as long as my hand. Those feet wear big boy shoes now, and snow boots. They jump, and skip, and run, and kick a ball. They are not baby feet. They are not toddler feet. They are boy feet. And they are still so sweet. And it is those feet that are tapping the beat of time for me, too. Because those feet are not going to stop growing, not for a long time. They will one day be longer than mine, and those boys will be men. Their feet keep telling me so. 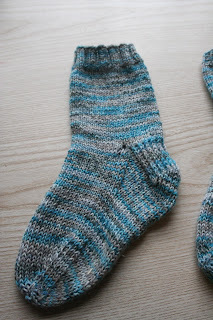 And it is for this reason that I want to start knitting socks for those growing feet. I want to mark the years with my socks. I want to cover their still-sweet toes and their still-soft soles with my love, my hours, my stitches. They can outgrow them, it’s okay. I will make more. And then I will make still more. 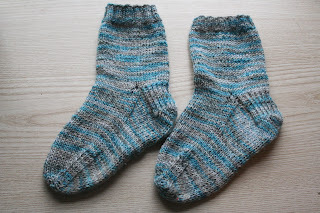 I will make socks for those sweet feet until I cannot knit another stitch. 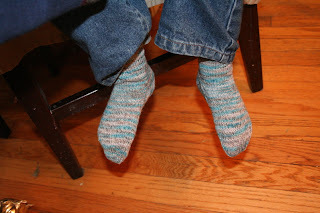 notes: I ended up making these a little short in the foot, unfortunately, and they also look like slightly different sizes, though I thought I knit them the same. 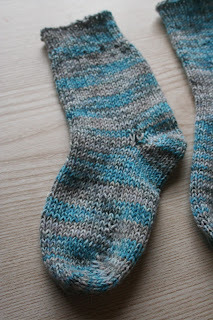 And the colors ended up coming out differently from one sock to the next. verdict: I’m not wild about knitting with this yarn (splitty, a bit slippery), but I love the final fabric, and it is taking a LOT of hard wear very well. After two pairs of children’s socks, I still have at least 1/3 of the skein left (at least enough for another pair of children’s socks, or maybe enough for a pair of yoga socks for me). I really liked using the basic recipe from this book to determine the pattern. This is my second toe-up attempt and this one did come out better than the last. My next toe-up attempt will be following Cat Bordhi’s New Pathways book – a book I’m very excited about. notes: somehow I made one sock slightly shorter and fatter than the other. What can I say – I was in a hurry. Still, you can’t tell that either pair has size discrepancies once they are on the foot. These are certainly not the prettiest or most interesting things I have ever made. But they hold an unusual amount of emotional content for me. 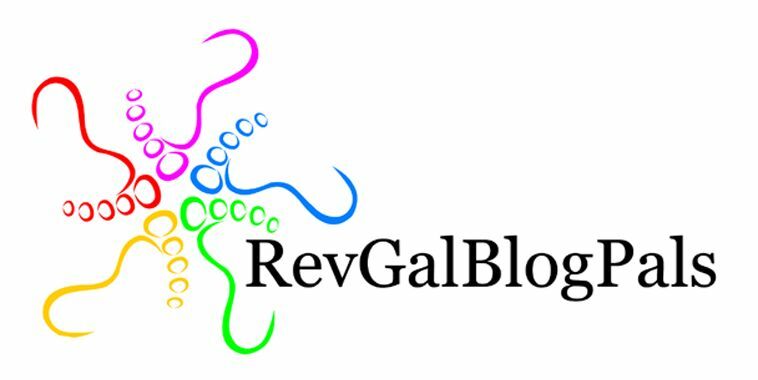 I have a strange strong love for them – and the feet that are in them! Not only do I tend to knit a lot for them, but my older son (age 6) has Big Ideas, and I’m forced to design for him, too. No wonder my own projects get shoved to the back of the list!! Aw, that post brought tears to my eyes! It also made me think of my 44 yo building contractor who came to work on the first cold day wearing a hat knit by *his* mama. I nearly kissed him for it! I hope my boys will still wear my homemade gifts when they are all grown up! Just as cute as they can be. Thanks for sharing! Very cute! And I’m sure your boys won’t notice any small issues with the socks–they’ll just love them because you made them! Awww! Sniffle. Baby feet! Kiddo feet! Never before have pictures of feet made my biological clock start ticking. This is a first. I look forward to many years of pictures of your boys’ socks. Won’t it be fun to be the only parent taking prom photos of the knees down?